Remember the Brightly fabric I started cutting and sewing a few weeks ago? The clingy rib cotton fabric (edited 5/2015 - no longer available in the shop) didn't work for the sweater/tunic as I had imagined. Drop shoulders were originally planned. Once I tried the sweater on, I knew I'd have to do a little fixing. And so I did. And now I'm happy. 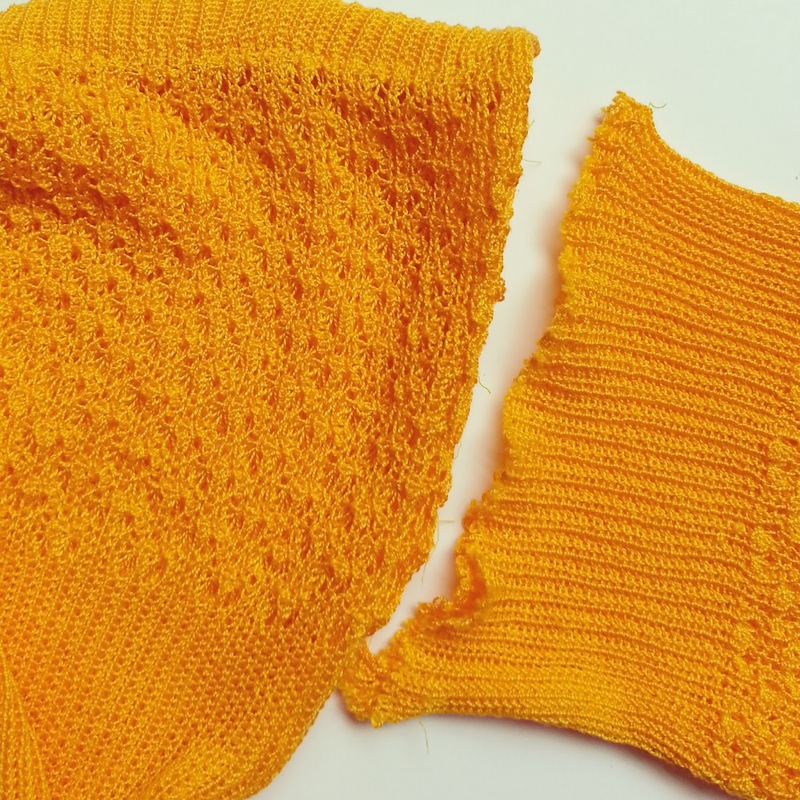 First I unpicked the sleeves on the sweater. Fortunately I had sewn them with the sewing machine and not the serger. 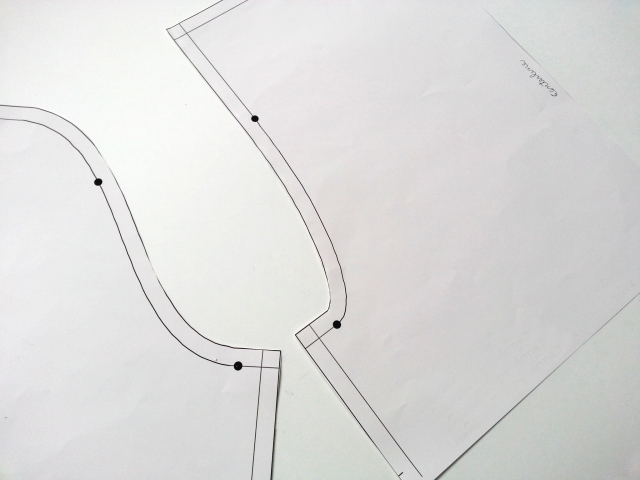 I then re-cut the sleeves and top of the bodice using my templates and lots of pins. Next I set in the new sleeves with pins, sewed the sleeves in, and finished all raw edges. The tunic no longer looks lumpy about the shoulders. 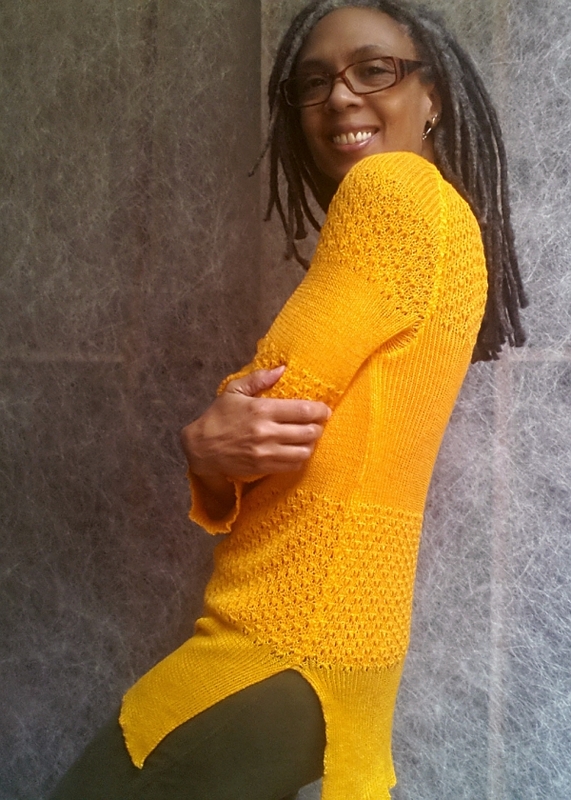 It has both drape and cling, and it's a sweater that's lightweight enough for summer. So I didn't get it done in time for the party... it's finished now, and there's lots of summer ahead. i'm so happy to see your beautiful face in these pics, and that color is genius. O, thank you! How nice of you to say! Love that marigold! Glorious! So beautiful on you! It's beautiful. I've got to get back to using my knitting machines especially my Passap. Love your blog. 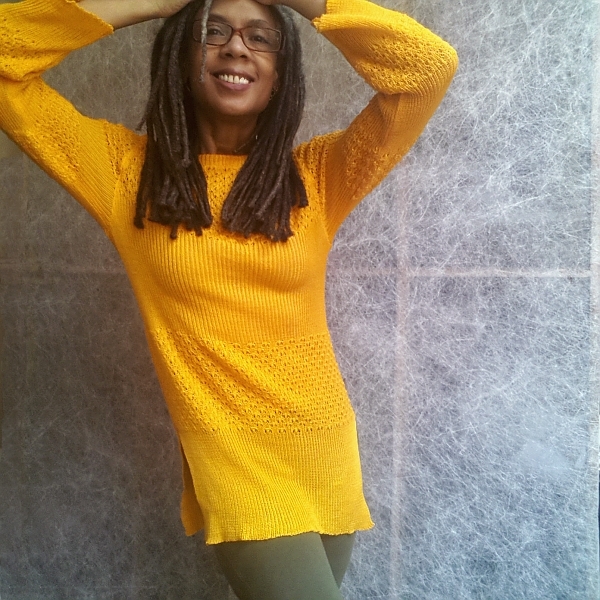 This sweater is gorgeous and looks fantastic on you! You wear this shade of yellow so well! Excellent job unpicking and getting that sleeve just the way you wanted it. It's really lovely. I've been meaning to visit ever since I saw your IG photo. Congrats on a beautiful tunic!